Everyone has a moment, at least once in their lives, where their eyes are opened to the true potential around them. It might be the first time having a custom brew of coffee after years of instant, trying an IPA after only ever having cheap pilsners, or even eating authentic Italian pizza after years of fast food. Sometimes you experience an epiphany, and you realize how much more an otherwise simple dish or drink can offer you. Bar Leather Apron is the sort of establishment that creates these epiphanies, such as the one I experienced last week when I tried their Mai Tai. I had my eye on Bar Leather Apron for a while now, ever since Taylor brought it up after learning that the 2016 Mai Tai Festival winner, Art Deakins, worked there. After checking out the menu on their website, we decided that it wasn’t the type of establishment we would hit up after work for happy hour drinks—not at our pay grade, anyway. 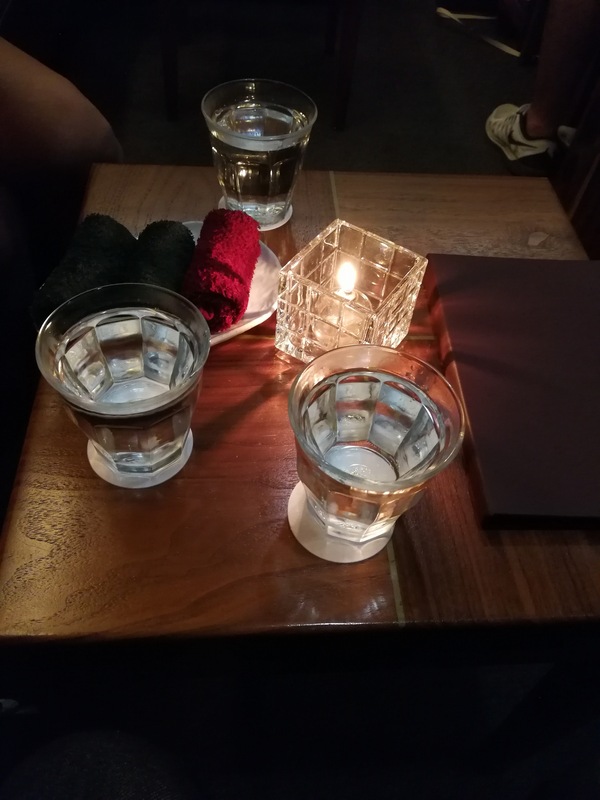 Our table, featuring mineral water, a small lamp, and moist towelettes. It wasn’t until a few friends of mine suggested we go there that I was able to actually check out the place. Tucked away in the mezzanine level of Topa Financial Center, a business building on the edge of Chinatown, Bar Leather Apron isn’t some place I’d stumble upon, especially due to my penchant of staying near Waikiki when I’d like a drink. It’s position is almost metaphorical, however, when you actually try their drinks: they’re really nothing like the other bars in the area; a step above the rest. While Paul Schreuder, 3rd place winner of this year’s festival, was at the bar that night, they didn’t have all the ingredients from his entry stocked, so I wasn’t able to try it myself. Rather, I ordered the “E Ho’o Pau Mai Tai,” which was Justin Park’s winning entry in the 2015 Mai Tai Festival. The Hawaiian name, “e ho’o pau Mai Tai” can be roughly translated to “the end of all Mai Tais,” a boastful name that the cocktail nonetheless earns. To break down the video, the serving of the Mai Tai begins with a glass filled only by two absinthe-coated ice cubes and an orange rind garnish. The drink itself is poured from a stopped flask that also contains kiawe wood smoke. The smoke is infused in the drink this way, a process which generally takes about five minutes. As the Mai Tai is transferred from the flask to the glass, the smoke diffuses into the air, releasing the fragrant smell of kiawe wood. The drink itself consists of raisin-infused El Dorado 5-year, coconut water syrup, spiced orgeat, lime, and ohia blossom honey. Once fully poured, a bit of El Dorado 12-year is splashed on top to create the float. Throughout the serving, the ingredients, process, and background of the cocktail are explained by the waiter. The end effect is not just a drink, but an experience that stimulates multiple senses, including sight, smell, sound, and (of course) taste. It should be clear at this point that this drink is completely unlike your run-of-the-mill Mai Tai, and is totally incomparable to the happy hour tiki cocktails you’d find in Waikiki. From the act of entering the bar, which is a small room tucked away in a business building, to being seated and receiving your drink, Bar Leather Apron sets itself apart. 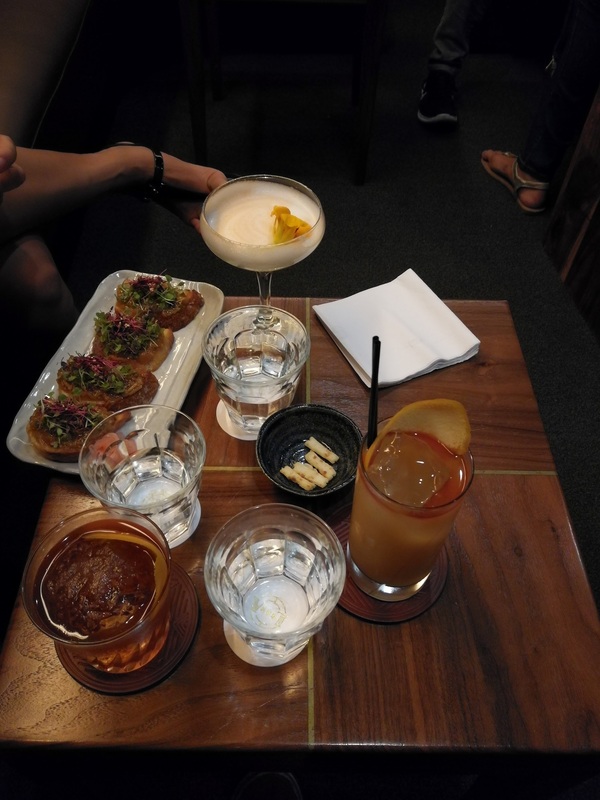 Pictured, clockwise from topa: yuzu sour, mai tai, old fashioned, and mushroom bruschetta. In its aspirations towards excellence, however, Bar Leather Apron might not appeal to every consumer. As I stated earlier, this isn’t the type of place I’d go to get drinks on the regular, nor is it a place I’d casually walk into. An $18 Mai Tai isn’t something I’d be ordering every month, either. Lastly, the bar is probably the furthest thing from tiki culture as well, so I suggest skipping it if that’s what you’re after. However, the entire experience offered by Bar Leather Apron is something every Mai Tai lover should consider. Don’t let the ingredient list throw you off: it really tastes like a Mai Tai, but with a few notable differences. Lime, honey, coconut syrup, and spiced orgeat, with the help of the orange garnish, create that classic sweet, fruity Mai Tai flavor with each ingredient working together in harmony rather than being overpowering. The kiawe wood smoke adds a lot of depth to the flavor of the cocktail, which already tastes great due to quality ingredients. The anise flavor from the absinthe also adds to the profile of the drink, bringing a new yet welcome twist to the established cocktail. I ordered two Mai Tais that night, in part because I really liked the drink that much and also because I didn’t take a video of the pour the first time (you’re welcome for that, by the way). My friends tried out the Yuzu Sour, Yuzu Highball, and BLA Old Fashioned, all of which tasted great and were fairly potent. The bar offers a few appetizers, but the main focus is without a doubt the cocktails. 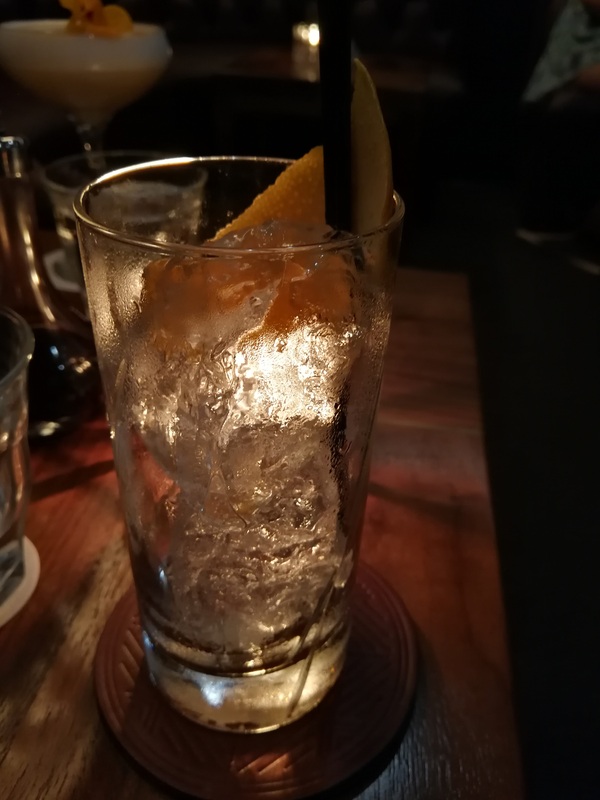 Anyone interested in mixology will love visiting Bar Leather Apron, but I think everyone would benefit from checking out the place, just by virtue of their drinks being really good. 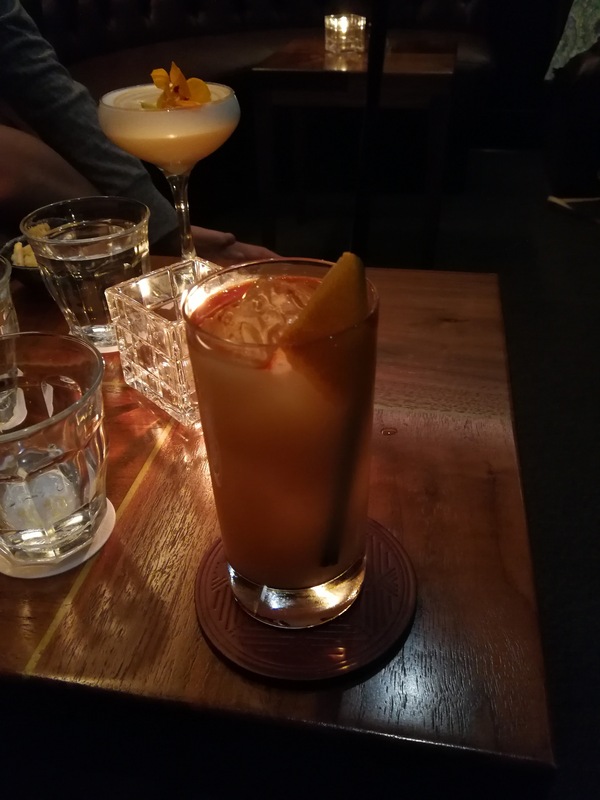 If your experience there is anything like mine was, you’ll leave with a newfound appreciation for cocktails. It isn’t the place I’d go for cheap happy hour drinks (they don’t have a happy hour), or to unwind with a group of friends (it’s a small bar), but every so often I’d just like to sit down and appreciate a well-crafted cocktail. That’s what Bar Leather Apron is for, and it fills out its niche better than anyone else.